British audiences have become most used to seeing Simon Keenlyside as an operatic baritone, so it is good indeed to be reminded of his consummate skill as a lieder interpreter. 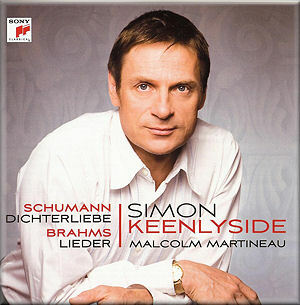 Keenlyside is no stranger to Schumann, having contributed a magnificent Kernerlieder to Hyperion’s Schumann edition. His Dichterliebe takes us on as great an emotional journey as you would expect from this singer. The opening song suggests hope without ever quite getting to its realisation, while Die Rose, Die Lilie throbs with the anticipation of youthful ardour, Keenlyside shading down his voice to suggest youth and impetuosity as well as excitement. This then gives way to proud nobility in Wenn ich in deine Augen seh’ as he find fulfilment in his love - or so he thinks. The grandeur of Cologne is evoked strikingly in Im Rhein, im heiligen Strome, before the loss which hits instantly in Ich grolle nicht. His skill in this song is to hint at wells of sorrow lying just below the surface while still putting on a superficially care-free expression to the rest of the world in Und wüβten’s die Blumen. Am leuchtenden Sommermorgen suggests gentle resignation, while the escapism of Aus alten Märchen winkt es is lovely. The end of the cycle is utterly bleak from the baritone, but Malcolm Martineau’s ever-sensitive accompaniment plays out the final bars suggesting the possibility of some redemption, however faint. It’s harder to divine much purpose to the Brahms selection. The songs are chosen from all across Brahms’ output so there is obviously no narrative link, and there doesn’t seem to be much of an emotional journey in them either, with thoughtful, cheerful and sorrowful songs all appearing without much rhyme or method. Musically speaking it remains very satisfying, however. Highlights include the wonderful sense of yearning and loss in An eine Äolsharfe, while the dark emotional world of Nicht mehr zu dir zu gehen is wonderfully evocative of a young man, head over heels with passion, who has no idea whether his feelings are reciprocated. There is a wonderful sense of peace to the sleepwalker of Nachtwandler, but it is clearly a fragile peace, a hair’s breadth away from the sorrow of the real world from which the sleeper is sheltering. The setting of “Genesen” (released) at the end of Auf dem Kirchhofe is marvellously appropriate, and this of all the songs showcases the emotional world that can be encompassed within three minutes. Abenddämmerung provides a satisfying conclusion to the sequence, its accompaniment suggesting both peace and restlessness at the same time. Keenlyside’s ever-skilful vocal acting enables him to inhabit the characters of each song to the hilt, though he is tested by the high tessitura of the opening Brahms song. His chest voice is resonant and compelling, providing emotional power while remaining thoughtful at all times. Martineau’s accompaniment is always entirely appropriate, illuminating the nuances - and often the duality - of each song with intelligence and sensitivity and often lending real grandeur to each setting, such as in Verzagen. My only doubt is over the acoustic which is rather too reverberant; the piano in particular sounds distant and muddied, something the engineers should surely have picked up on. After a while you can zone this out, though, and you will enjoy a fine Lieder recital which, while it may not say much that is new about either sequence, will reward repeated listening.